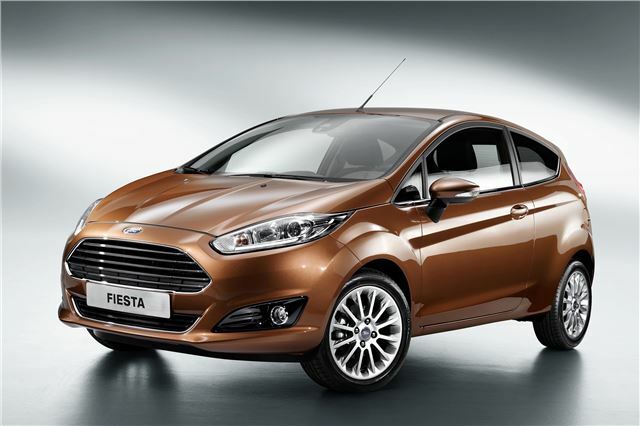 Ford has announced that there will be twelve engines available in the new Ford Fiesta. The line up begins with the familiar 1.25 and 1.4 litre 'Sigma' four cylinder petrol engines. There will be an LPG version of the 1.4. The 1.0 three cylinder engine will be offered in two non-turbo outputs of 65PS and 80PS, both under 100g/km CO2 when fitted with auto stop start. Turbocharged 1.0 Ecoboost engines will feature with 100PS or 125PS, also both under 100g/km with auto stop start. There will be a 1.6 105PS petrol engine with the 6-speed dual clutch Powershift automatic transmission, as in the B-Max. The 1.5 litre 75PS diesel offered in the B-Max will also be available in the Fiesta, again less than 100g/km CO2, together with the 1.6 litre diesel with 95PS and, presumably, 115PS outputs. The 1.6 Econetic diesel will remain 87g/km CO2. Finally, the Fiesta ST will have a 182PS version of the 1.6 Ecoboost capable of taking it to 60mph in 7.6 seconds.